'Underwear Bomber' Pleads Guilty : The Two-Way Umar Farouk Abdulmutallab was arrested for trying to blow up a Detroit-bound passenger jet on Christmas Day 2009. In court today, he insisted that while he is guilty under U.S. law, he is not guilty under Islamic law. Umar Farouk Abdulmutallab is this hour pleading guilty to attempting to blow up a Detroit-bound passenger jet on Christmas Day 2009. 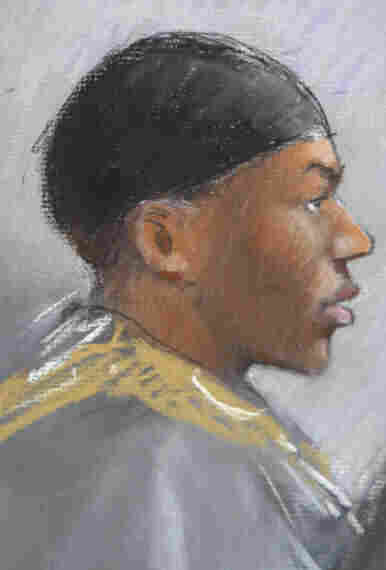 A courtroom drawing, from earlier this week, of Umar Farouk Abdulmutallab. "Abdulmutallab says he's satisfied with Chambers and the advice he has received." As the Free Press reminds us, "there are eight counts. The most serious counts carry a maximum penalty of life in prison." Now, the Free Press reports, Abdulmutallab is pleading guilty as the judge reads off each count. Earlier this week, NPR's Dina Temple-Raston reported that Abdulmutallab's trial might provide "a window into al-Qaida's recruitment process" and clues to the ties between American-born radical imam Anwar al-Awlaki and al-Qaida terrorist operations. Al-Awlaki was killed last month in Yemen by a CIA drone strike. Update at 12:20 p.m. ET: Sentencing has been set for Jan. 12, the Free Press says. It adds that "Abdulmutallab faces a mandatory 30 years in prison, but could get life for some of the charges, which include conspiring to commit terrorism and using a weapon of mass destruction." Update at 11:10 a.m. ET. Abdulmutallab Calls "Jihad" One Of "The Most Virtuous Acts." Abdulmutallab said "he was guilty under U.S. law, but not under Islamic law, for the crimes charged. ... He warned the U.S. that, if it continued to murder innocent Muslims, a calamity would befall the U.S. "If you laugh at us now, we will laugh at you later," he said. ... He said committing jihad against the United States is one of "the most virtuous acts" a Muslim can perform. The Detroit News says he called the bomb he tried to detonate a "blessed weapon to save the lives of innocent Muslims." Update at 10:26 a.m. ET: The Detroit News writes that Abdulmutallab "pleaded guilty to eight charges after he returned from a 45-minute recess, ending the most high-profile terrorism case in the United States since the Sept. 11, 2001, terrorist attacks. ... The plea was unexpected but ended a criminal trial filled with unexpected outbursts by Abdulmutallab, who exhibited defiant behavior, fired his legal team, mulled a guilty plea last year and opted to defend himself. During court hearings, he propped a foot on the defense table and shouted al-Qaida leader Osama bin Laden and radical cleric Anwar al-Awlaki were alive." There were about 300 people aboard the Northwest Airlines flight from Amsterdam. The explosive device hidden in Abdulmutallab's underwear did light, but did not detonate and he was subdued by passengers and crew.